-Driving inputs directly determine the hidden units, and hidden units effect outputs. -To infer the hidden state could help us to predict the output: a linearly transformed Gaussian is a Gaussian. Can be computed using “Kalman filtering” efficiently, a recursive way for updating representation of hidden states given new observations. -Hidden state has linear dynamics with Gaussian noise (applying a linear model with Gaussian noise) —>Do a good job. 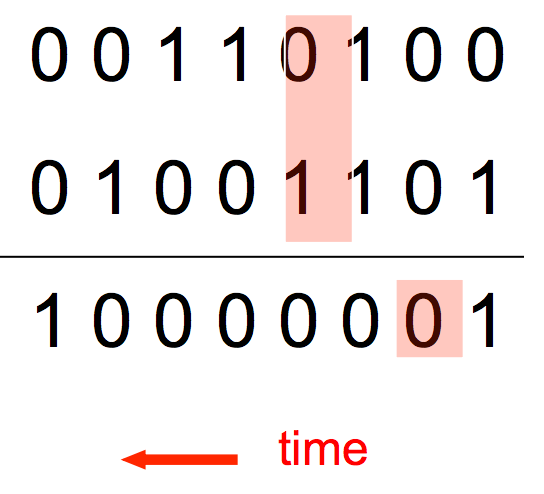 Transactions between states are stochastic and controlled by a transition matrix. Output model is also stochastic-> not sure which state produced a given output. (state is “hidden”)But it’s easy to represent a probability distribution across N states with N numbers (the hidden units). A limitation of it, memory is short, and states are huge! – Distributed hidden state, storing info about the past! – Non-linear dynamics, updating hidden states in complicated ways. – using different weights, doesn’t generalize to the end of the long number. How it determines the next state? For instance, given the current state is “no carry print 0”, if the next column is “01”, then it turns out to be “no carry print 1”. Two input units and one output unit. It is able to learn the patterns, at one time step to vote for the hidden activity pattern at the next time step. Powerful: with N hidden neurons, 2^N possible binary activity vectors, but only N^2 weights (fully interconnected). In the backward pass, if you double the error derivatives at the final layer, all the error derivatives will double —> Linear! -Hessian Free Optimization : using a fancy optimizer that can detect directions with a tiny gradient but even smaller curvature. -Echo State Networks: initialize carefully and hieraticially (from input to hidden, hidden to output). -Good Initialization of Momentum: how to init? we learn all of the connections using momentum. For momentum, go here. Remember things for a very long time! LSTM Cell: an analog using a circuit. All gates controlled by 0 and 1. We first set the keep gate to be 0, and write gate to be 1, we will write a value 1.7 to the cell. Then keep gate sets to be 1, so we will keep the value. Next also keep gate is 1, and we set read gate to be 1, thus reading the value from the cell. Last the keep gate to be 0, we flush out the value eventually. Inputs is a sequence of (x,y,p), (x,y) the locations of the pen, p is for whether the pen is up or down. The output is a sequence of characters. They used a sequence of small images as input instead. A live demo (interesting and relevant) can be found here . 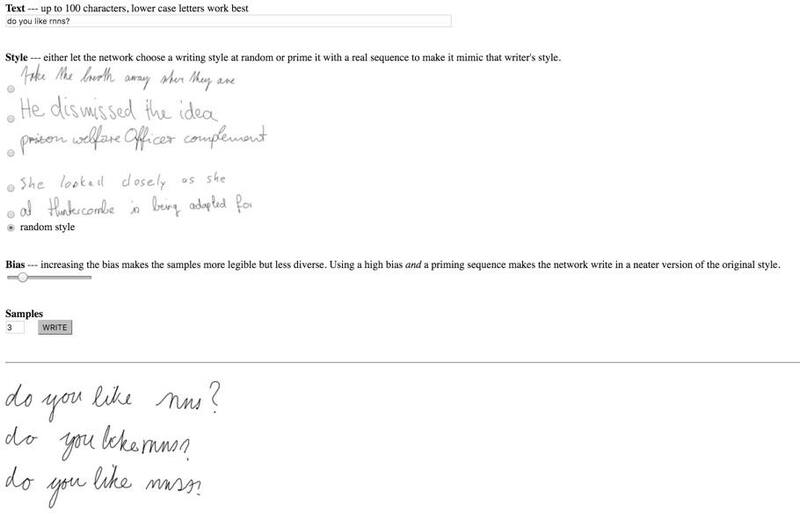 It generates the typed strings into a certain handwritten style by using LSTM.